For the second summer in a row, students in Belmont’s College of Science and Mathematics are finding themselves spending their days in the Janet Ayers Academic Center’s labs—experimenting with lasers, exploring quantitative differences in guitar resonance patterns and analyzing the movement of ballroom dancers, among other things. SURFS, Belmont’s Summers Undergraduate Research Fellowship, was created last summer based on the vision of Chemistry and Physics Department Chair Dr. Robert Magruder and offers a unique opportunity for the 23 students studying chemistry, physics, biology, psychology and mathematics to experience a long-term research project. With nine faculty members serving as student advisors, the SURF program allows participants to experience a 6-week research project first-hand. Drs. Scott Hawley, Steven Magruder and Devon Ferrara led a group of fellows through a project using a laser interferometer to observe the vibration patterns that develop on a square metal plate as it vibrates at different frequencies. As the first signal the instrument has generated, the interferometer will be used to evaluate differences in resonance found on guitar faces. The software used to conduct the project was created by Hawley and physics/audio engineering technology double major Steven Shook. Efforts are currently underway to improve image quality for the software. A second group, advised by Ferrara, filmed dancers at The Ballroom, a dance studio in Nashville, to analyze the physics of ballroom dancing alongside Steven Black, owner at The Ballroom. 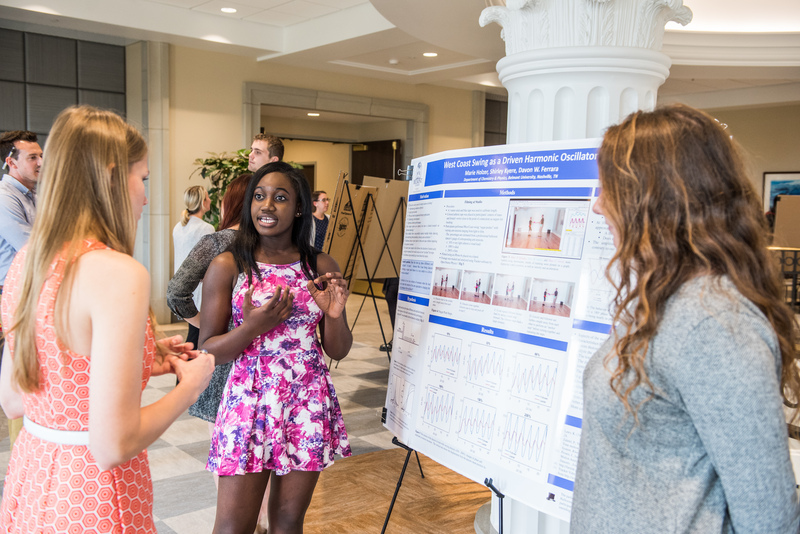 Student scientists presented their findings at the SURFs poster presentation on Friday, July 13 in the Janet Ayers Center.